Mary, the Mother of Jesus, was at a wedding feast in the village of Cana in Galilee. Jesus and His disciples had been invited and were also there. When the party was in full swing they ran out of wine. Mary told Jesus about the problem because she knew that He could easily stop the family, who were hosting the feast, from being disgraced and humiliated because of their poor planning. In answer Jesus replied, “My hour has not yet come.” But Mary was not at all discouraged by Jesus’ words because she knew that her loving son would listen to her. So, she confidently told the servants to do whatever Jesus told them to do. At the feast, there were six very large stone water jars that were used by the people for the ritual washing of their hands. 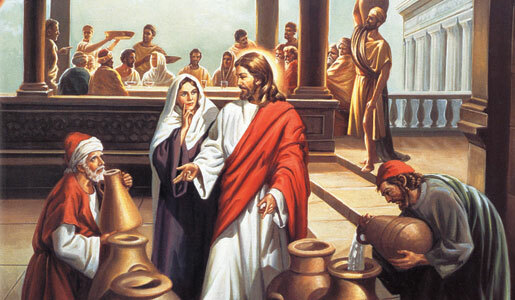 Each huge jar held about one hundred litres and Jesus told the servants to fill them right up to the brim with water. When they were full, Jesus told the servants to take out some of the water, which had been miraculously turned into wine, and give it to the head waiter. He did not know where the wine had come from, but when he tasted it he was truly amazed. Quickly, he called over the bridegroom and said, “The best wine is always served first. Then, when the guests have had plenty to drink, we serve the wine that doesn’t taste so good, but you have kept the best wine until last!” This was Jesus’ first miracle, and through it he shows His disciples the awesome power that was working through Him. When the disciples witnessed this miracle they realised that Jesus was no ordinary teacher and they began to believe in Him. If we sincerely want to experience inner or physical healing in our lives, we must first invite Jesus into our hearts. If the family had not invited Jesus to the feast, he would not have been able to save them from dishonour. Whenever we are in trouble or danger, our first instinct should be to invite Jesus to come into the situation and take complete control of it, according to His holy will. Jesus is always waiting to be invited into our lives so that He can reveal how extraordinary His love and mercy is. “Behold, I stand at the door and knock. If anyone hears my voice and opens the door, then I will enter his house and dine with him, and he with me.” (Revelation 3:20) Let’s open the door of our hearts and let Jesus in!